All artistic and architectural effects are evoked, mediated and experienced through poeticised images. These images are embodied and lived experiences that take place in ‘the flesh of the world', becoming part of us, at the same time that we unconsciously project aspects of ourselves on to a conceived space, object or event. Artistic images have a life and reality of their own and they develop through unexpected associations rather than rational and causal logic. Images are usually thought of as retinal pictures but profound poetic images are multi-sensory and they address us in an embodied and emotive manner. Architecture is usually analysed and taught as a discipline that articulates space and geometry, but the mental impact of architecture arises significantly from its image quality that integrates the various aspects and dimensions of experience into a singular, internalised and remembered entity. The material reality is fused with our mental and imaginative realm. The book is organised into five main parts that look at in turn: the image in contemporary culture; language, thought and the image; the many faces of the image; the poetic image; and finally the architectural image. The Embodied Image is illustrated with over sixty images in pairs, which are diverse in subject. They range from scientific images to historic artistic and architectural masterpieces. Artworks span Michelangelo and Vermeer to Gordon Matta-Clark and architecture takes in Modern Masters such as Mies van der Rohe, Le Corbusier and Alvar Aalto, as well as significant contemporary works by Steven Holl and Daniel Libeskind. 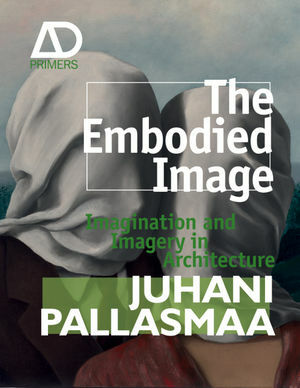 Juhani Pallasmaa is one of Finland's most distinguished architects and architectural thinkers. His previous positions include: Rector of the Institute of Industrial Arts, Helsinki; Director of the Museum of Finnish Architecture, Helsinki; and Professor and Dean of the Faculty of Architecture, Helsinki University of Technology. He has also held visiting professorships at several universities worldwide. Pallasmaa is the author/editor of thirty books, including The Eyes of the Skin: Architecture and the Senses (Academy, 1995 and John Wiley & Sons, 2005) and The Thinking Hand: Existential and Embodied Wisdom in Architecture (John Wiley & Sons, 2009). 1 Image in contemporary culture. Image production and the feasibility of architecture. Images of control and emancipation. The sense of the real. 2 Language, thought and image. The meanings of image and imagination. 3 The many faces of the image. The lived and embodied image. The image as a condensation. The archetypal image in architecture. The reality and unreality of the artistic image. Images of incompleteness and destruction. 4 The anatomy of the poetic image. The dual existence of the poetic image. Historicity of the mind and poetic time. Unity of the arts: art and life. Architecture as an organising image. The house and the body. Primal architectural images and archetypes. The imagery of the window and the door.